There is, perhaps, no street in Atlanta more fitting than Auburn Avenue to house For Keeps bookstore. Located in the historically black Sweet Auburn District, Rosa Duffy, 28, has opened a place she hopes will invite everyone, but especially black people, to come in and stay awhile. 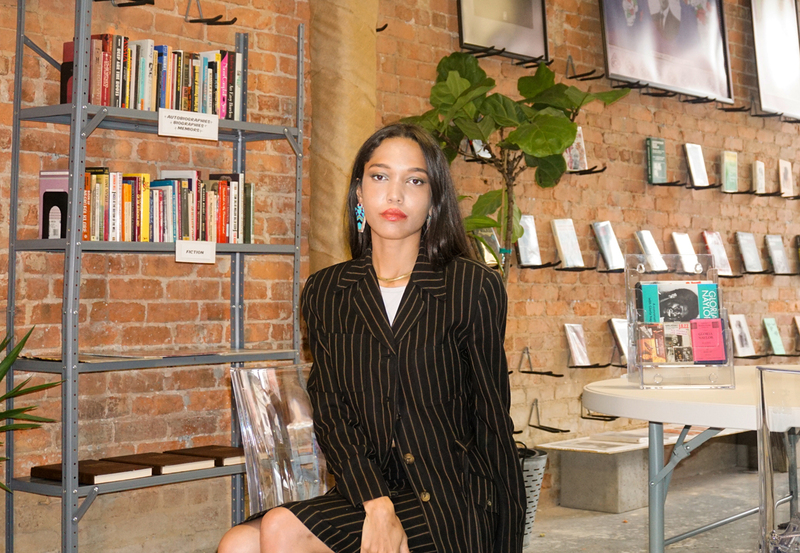 Inside the space, located at 171 Auburn Avenue, Duffy adjusts the books on display, wearing a caramel turtleneck, wide-legged blue jeans, and patent leather boots. A Kanga cloth from Tanzania that reads “Hongera Barack Obama,” (Swahili for “congratulations”) with a monochrome photo of the former president, hangs on display on one wall. Duffy’s own prints, sourced from old magazines and newspapers, including the Atlanta Daily World, are on display on the opposite wall. For Keeps Bookstore is more than a place for visitors to purchase rare and classic black books. Duffy designed it to also be a reading room where people can stop in and interact with history that is often overlooked or placed in the bottom of the dollar bins at other bookstores. “I was stealing all [of my dad’s] stuff, and then I was trying to buy new copies of those books so that I could put his books back,” she says. Duffy’s appreciation for black literature stems from her parents, who are Spelman College and Morehouse College alumni, as does her desire to preserve black history. Her family has deep Atlanta connections; her father, Eugene Duffy, has worked with former Atlanta mayors Maynard Jackson, Andrew Young, and Kasim Reed. 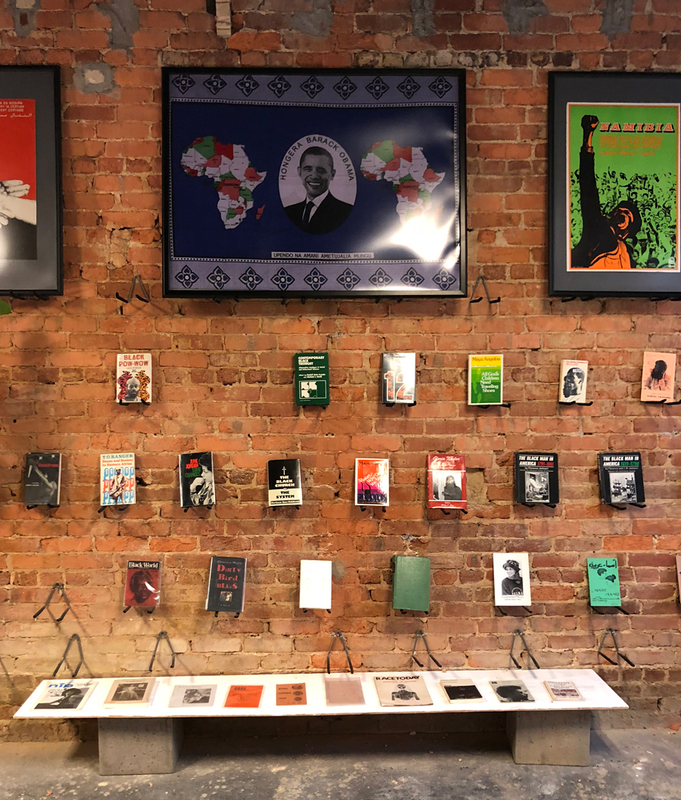 It wasn’t much of a surprise, then, when Reed strolled into For Keeps last Saturday, the shop’s opening day, and purchased a book by poet and political activist Amiri Baraka. Rosa Duffy says Reed was among about 200 people who visited the bookstore in its first weekend. When Duffy’s older sister, lawyer and journalist Josie Duffy Rice, tweeted about the store’s arrival the night before the grand opening, it received a ton of attention, including a retweet from filmmaker Ava DuVernay. For Keeps offers a mix of books both for sale and some that are for reading in-shop only. Not all of the books are “rare,” but Duffy says some of the works that aren’t for sale are first editions or books that only went to print once. Duffy says she slowly amassed the collection by visiting bookstores such as Strand Book Store and Alabaster Bookshop in New York, as well as seeking out small collectors and publishers online. She says she’d often find works, such as poet Pat Parker’s Jonestown and Other Madness, in the dollar bin at bookstores. She admits some of her collection was expensive to amass but much of it, she says, she got for cheap. “Because people aren’t totally informed on the black experience or black [literature], and they don’t hire black folks to go through it, they were selling their stuff for crazy [low] prices,” she says. Duffy says she’s hoping For Keeps will help dispel the myth that black people aren’t interested in learning about their history. She says she’s hoping that For Keeps, and the fact that people don’t have to purchase anything to engage with the literature inside, will help create an atmosphere where black literature feels accessible to anyone who is interested. She eventually wants to create additional reading space in a back room, and she says there will eventually be coffee available, too. Events will also be held in the space. The first event will feature Duffy’s grandmother, Dr. Josie Johnson, who will be promoting an upcoming book on her experience lobbying for fair housing in Minnesota. Duffy says she knows some people might think it’s a serious risk to open an independent bookstore in 2018. She wants For Keeps to be around for a long time, but she’s okay if it’s just a temporary neighborhood gem, too. For Keeps is open Thursdays through Sundays from 10 a.m.-5 p.m at 171 Auburn Avenue. This weekend, on November 17, they are open 9 a.m.-2 p.m. and closed Sunday the 18th. Follow their Instagram for updates.